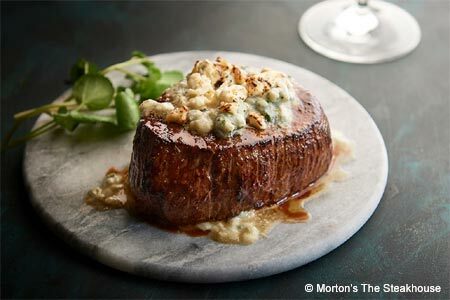 Morton’s offers understated elegance and serves USDA Prime aged steaks in the French Quarter. : Remember when people dressed up for dinner? They still do at Morton’s, where you can enjoy an evening of finely prepared food and cocktails. The New Orleans edition of this national chain occupies the epicenter of the downtown visitors' circuit, in a space that follows every code of steakhouse design: lights are dimmed; booths are plush; woods are dark mahogany. The steak selection is safe and solid, offering just about every cut of USDA Prime wet-aged beef a carnivore could crave. Shrimp cocktail appetizers, Caesar salads, and vegetable and potato side dishes also are available. At the end of such meals, nothing tastes more appropriate than the molten Godiva chocolate cake or the Grand Marnier soufflé. Given the menu, the wine list excels in its selection of reds, especially from California and Italy, with support notes from France, Spain and Down Under. Well-heeled regulars may lease their own private wine lockers. In a town with several locally owned steakhouse institutions, Morton’s holds up well against its competitors. Show up early for the “Power Hour,” when mini sirloin burger sandwiches and other bar bites are served.